Pickleberry Pie: Hospital Concerts for Kids! 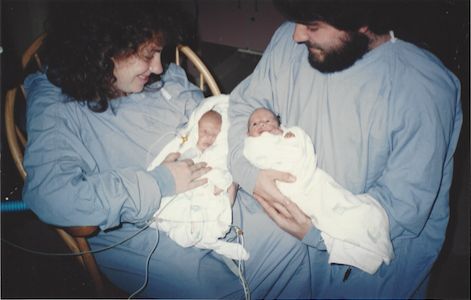 ''I had premature identical twins who were in the hospital for 5 weeks. While there, my husband and I, both musicians, sang to them and played tapes of our music. After they came home from the hospital we decided to become full-time musicians. Ironically, we came up with our group name - Two of a Kind - 5 years before our twins were born, so our name came true. We mostly perform for children. While touring we connected with an organization called Pickleberry Pie and started performing in hospitals. We've had some profound experiences as performers in the hospital. The most incredible experience was when we sang for a baby on the Pediatric ICU at UVA Hospital on New Year's Eve Day 2015. We were singing Twinkle Little Star, and Baa Baa Black Sheep and everyone was singing along, including the hospital staff, and the little baby smiled. Everyone was crying and we had no idea what happened, but it was a very special moment. A few months later the parents tracked us down and told us that their son died the very next morning while waiting for a heart transplant. They felt that moment was a precious memory that they will cherish forever, because at that moment they just felt like parents, not parents of a sick child, just parents enjoying singing together.